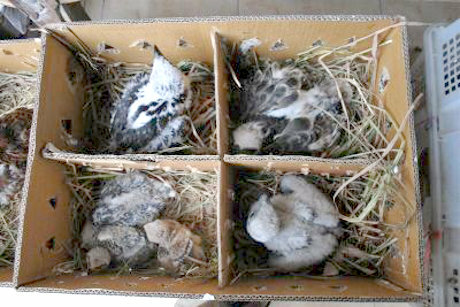 (10/03/2009) The Natural Resources Conservation Center of the Forestry Department in Bali (BKSDA Bali), with the help of ProFauna Indonesia -a wildlife protection organization, succeeded in the apprehension of a wildlife syndicate involving two Japanese smugglers (October 2nd, 2009). After receiving the information from ProFauna Indonesia, BKSDA Bali held an operation and managed to seize 16 rare species and arrest two Japanese men named Naoki Kammatsu and Tonotobu Yamamoto. The protected species consisted of eagles at the majority, including the Javan Hawk-Eagle (Spizaetus bartelsi) which is endangered. Besides the two Japanese traders; BKSDA Bali also caught five Indonesian men: Tholib Lukman, Mohamad Avansa Solihin, Amir, and Made Artana; who were allegedly involved in the international syndicate. These local people acted as messengers and middlemen. The wildlife were about to be smuggled to Japan through Ngurah Rai International Airport in Bali by cramming the eagles in plastic gutter pipes. The modified pipes were then packed in a baggage. The eagles were originated from some locations in East Java. From East Java, those animals were carried in a truck heading Denpasar city, Bali, and intended to be smuggled trough the airport. The arrest of the international wildlife syndicate in Bali showed that Bali is still susceptible to be the exit point of the international wildlife smuggling. Chairman of ProFauna Indonesia, Rosek Nursahid, stated, "The authorities should take full investigation on the allegations of the Japanese men's involvement in several smuggling. This shows that some allegedly corrupt officers of Ngurah Rai airport, Bali." 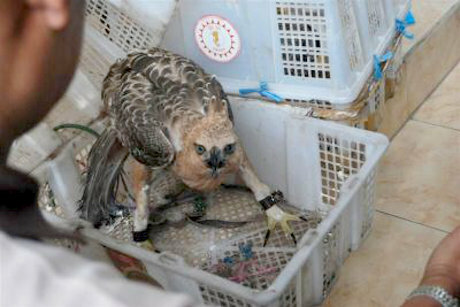 According to ProFauna's records, some protected wildlife were successfully smuggled to Mumbai, India, through Ngurah Rai airport. The authorities are still investigating this case. The illegal trade violates the 1990 Wildlife Act Number 5 concerning the Conservation of Natural Resources and the Ecosystem. The offenders are liable to five year prison term and 100 millions IDR (10,000 USD) fine. ProFauna encourages the authorities to fully enforce the law to the allegedly corrupt officers of Ngurah Rai airport who are involved in the international illegal wildlife trade.